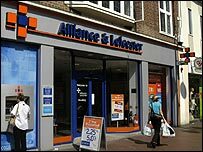 The Alliance & Leicester bank (A&L) has sought to reassure its investors over its exposure to sub-prime mortgages in the United States. In a stock market update the bank said it had not lent any money directly to US firms offering sub-prime mortgages. However, the bank has invested £175m in some of these mortgages indirectly, via investment vehicles known as CDOs. A&L said 99% of this had been rated AAA by investment ratings agencies, so the money was very likely to be repaid. The cost of lending between banks, as measured by the Libor interest rate, has risen in recent weeks, due to fears of hidden losses among them. But the A&L stressed that this was having little impact on its business. A spokesman said the bank was not having to raise money in the wholesale money markets to fund its variable rate mortgage lending activities. "Current conditions in the funding and liquidity markets have had no material impact on either profits or franchise growth," said the bank. "We have not been materially impacted by recent changes in Libor, with our variable-rate retail funding base continuing to be greater than our variable rate mortgage book," it added.